Molly and I had just sat down to lunch at the local co-op two weeks ago, and the first topic at hand was one that we both wish we never had to discuss. 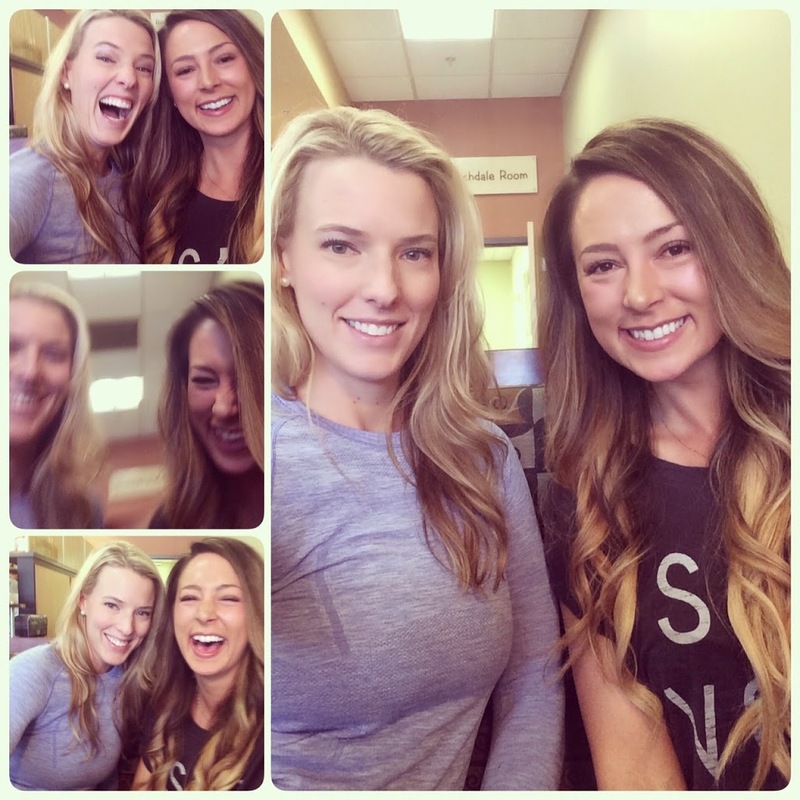 What’s lunch with a bestie without a selfie photo shoot? Women reach out to Mols and I on a daily basis, asking for our guidance to help them get leaner and healthier. We both feel like we were put in this world to help people achieve their best health, and most confident self possible, so we are grateful for the opportunity and love hearing from everybody. The problem is that many of these women are only eating 1,300 calories a day, and exercising like it’s their job – sometimes doing two-a-days, which, for the record, makes our skin crawl at the mere mention of. This type of scenario has, sadly, become the norm. Women are going to extreme, unhealthy, and unnecessary measures, ironically, in the name of “health and fitness”. We’re constantly seeing ludicrous things posted by women on Facebook about how they’re hammering out two-a-day cardio sessions, twice daily WODs, doing HIIT five days a week, hours of fasted cardio, and the list goes on. These same women are the ones that are watching what they eat like a hawk, demonizing carbs, and obsessing over MyFitnessPal. Far too many women are overtraining, undereating, over-cardio-ing (I’m sure that’s a word somewhere) and putting themselves through the wringer, desperate to get the results that they want, and yet … it’s not working. My heart bleeds for these women. Know why? Because I used to be one of these ladies. When I was 17, my (then) boyfriend looked me in the eyes and said, “You know, you’re getting kinda fat”. It threw me into a rage of fury. I was upset at him for approaching it in such a rude way, but more importantly, I was mad at myself because I knew it was true. I was chowing down on fast food all of the time, and went out of my way to avoid any type of physical activity, and it was starting to show – my weight was at an all-time high. Hell-bent on making changes, I launched myself into the gym with fervor, taking every aerobics class offered. I made the rookie mistake of being overly restrictive with my calories – and let’s not even discuss my food choices. I remember eating a turkey sandwich for lunch, and a bowl of Cream of Wheat for dinner, and forcing myself to starve the rest of the time. The less calories, the better, right?? This madness peaked after I moved to Las Vegas. I was doing insane amounts of cardio, taking a ‘more-must-be-better’ approach, winging my strength training because I had no idea how to properly progress, and running a chronic sleep deficit. Throw in a bunch of fat burners and it was a recipe for disaster. And more importantly, I felt like crap all of the time. I was burning the candle brightly from both ends, working out like a fiend and barely eating. When our on-staff Exercise Physiologist took my bodyfat, my weight had continued to decrease, but so had my muscle mass, and – you guessed it – my body fat had actually increased. It wasn’t until I made a total overhaul to my nutrition and training that my body finally started to change, and I began to feel better. The mistakes that I made are not at all uncommon. As a matter of fact, I believe that the internet and social media has left things fuzzier than ever for women, as they are inundated with more bad information than ever. Doing way too much cardio and conditioning, both in frequency and in duration. Not doing any strength training because they are unsure of where to start. Winging it in the gym because they are unsure of how to manipulate the variables to keep progress moving along. Making the wrong food choices. The right training and nutrition is about so much more than having a nice body. You deserve to move better, feel your best, and ooze confidence. We want you to be able to pick up your kids with ease, chase your dog around the park with plenty of energy to spare, go on fun hikes this summer, and feel good about yourself. You ladies have been asking – begging – for a program designed specifically for you that addresses proper training, warm-ups, cool-downs, recovery, techniques, and nutrition programs, and Girls Gone Strong has delivered. The fantastic thing about GGS is that we speak from experience – both our own, and from hundreds of clients that have gotten fantastic results. We know the exact formula and dosages that are required to get women stronger and leaner, while becoming healthier than ever. After almost a year in the works, fielding hundreds of emails and questions to find out exactly what you need, and listening to all of your thoughts and concerns, this program covers it all. The Modern Woman’s Guide to Strength Training is finally here! What training program should I follow? How do I perform these exercises? From start to finish, all of the guesswork has been removed. Whether you want to simply get started, get stronger and leaner, take things to the next level, or fine tune what you are currently doing, this program is perfect for you. You now have every single tool that you need in order to become your healthiest and happiest you. No more waiting. Life is short. Let’s do the dang thing! This sale ends Sunday night at midnight, which is when the price goes up forever-ever. Hurry! If you have any questions, or want to chat about this program, I am here for you! Simply shoot me an email at JenComasKeck@gmail.com, and I’ll respond immediately. Girls Gone Strong invades Baltimore!